Leading Manufacturer of monoblock liquid filling machine and semi automatic water filling machine from Ahmedabad. 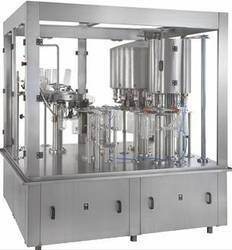 These Monoblock Liquid Filling Machine are known for their best quality in market and these are also available at very reasonable price. These machine is suitable for capping on Round or other shape of Glass, Plastic, PET, LDPE, HDPE Bottles. Our client can avail these machines at very reasonable price. The frame structure will be of MS and will be suitably cladded with SS. The bottles from the Air conveyor will be taken by the star wheels and gripped by the In feed neck guide plate .On rotation the in feed neck guide plate will deliver these bottles to the Rinsing gripping fingers. The gripping fingers will hold the bottles by neck and necessary guide bars will invert the bottle up side down by 180 degree. The duly inverted bottles will receive water from the rinsing nozzles on rear of the machine. The rinsing will operate from 90 to 270 degree rotation of the rinsing machine. Zero degree position is in front of the operator. In 180 degree rotation the washing cycles will be stopped and bottles will be re-inverted and delivered through out feed neck guide plate to the filling Unit. Filling Capacity: 20-30 Bottles/Minute Depending upon filling volume. Filling Range: 500ml. to 2Ltr. Filling Heads: 6 (Six) Heads. M.O.C. Contact Part of S.S. & other M.S. Latest Air Conveyor Technology- Less weight’s Bottle also run smoothly. Aluminum & Glass Door Section-For Good Transparency. No Bottle - No Rinse - No Fill - No Capping system. Drive is on chain of gears (Indexing Cam) hence low on maintenance. No Electronics involved in any function. Hence, User friendly. 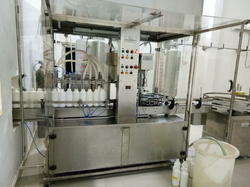 Looking for Monoblock Liquid Filling Machine ?